This documentary uncovers the unholy alliance between Nazi Germany and some of the biggest corporations in the US — companies which were indispensable for Hitler to wage war. Henry Ford, the automobile manufacturer; James D Mooney, the General Motors manager; and Thomas Watson, the IBM boss were all awarded the Grand Cross of the German Eagle — the Nazi's highest distinction for foreigners for their services to the Third Reich. Greece is on a collision course with the eurozone’s creditor powers after emergency talks ended in acrimony on Monday night, triggering the most serious political crisis since the launch of the euro. The Leftist Syriza government reacted with fury to eurozone demands that it must stick to the country’s discredited austerity plan, describing the draft text as “absurd and unacceptable”. Yanis Varoufakis, the Greek finance minister, said Eurogroup finance ministers had ignored a deal already agreed with the European Commission for a four-month delay and a “new contract for growth”, returning instead to old demands. "The only way to solve Greece is to treat us like equals; not a debt colony,” he said, predicting that EU authorities would soon have to withdraw their latest “ultimatum”. 1,7 Bio. Dollar werden weltweit scharia-konform verwaltet – rund ein Prozent des Finanzmarktes. Die Nachfrage steigt. Der Amerikaner John Sandwick hat sich in Genf auf scharia-konforme Vermögensverwaltung spezialisiert. Greece’s finance minister Yanis Varoufakis has spelled out the negotiating strategy of the Syriza government with crystal clarity. “Exit from the euro does not even enter into our plans, quite simply because the euro is fragile. It is like a house of cards. If you pull away the Greek card, they all come down,” he said. at the parliamentary session of Syriza. 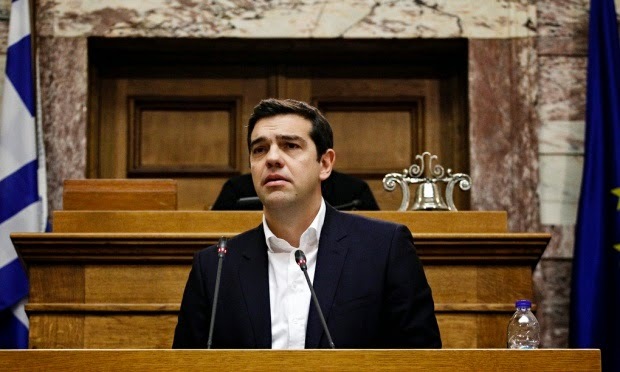 The Greek prime minister, Alexis Tsipras, has announced his anti-austerity government programme in a defiant address that prioritised the jobless and destitute over international creditors who have lent the country more than $300bn (£200bn). In his first policy speech before parliament, he said his government did not have the right to prolong the five-year bailout deal that has foisted austerity on Greece, and felt a duty “not to disappoint” those who had voted him into power.